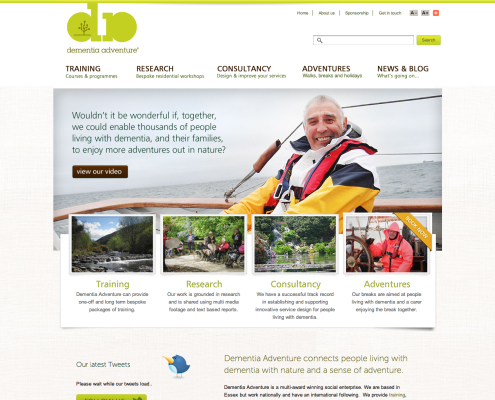 Here you will find a range of resources that may be of interest to carers of a person with dementia. 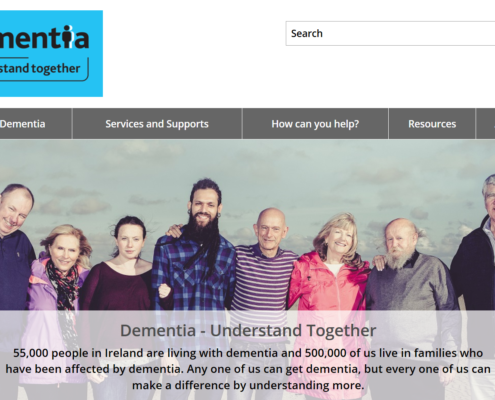 Understand Together is a public support, awareness and information campaign, aimed at inspiring people from all sections of society to stand together with the 55,000 Irish people living with dementia. The ultimate aim is to create an Ireland that embraces and includes people living with dementia, one which displays solidarity with them and their loved ones. 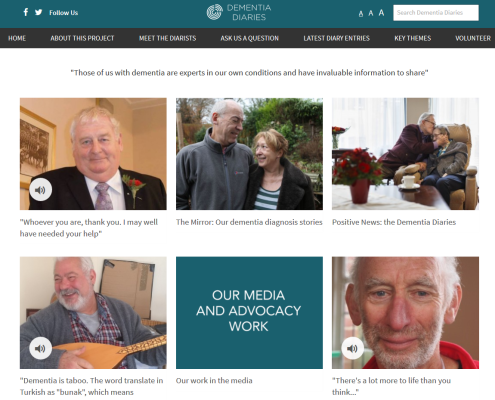 Dementia Diaries is a UK-wide project that brings together people’s diverse experiences of living with dementia as a series of audio diaries. It serves as a public record and a personal archive that documents the day-to-day lives of people living with dementia, with the aim of prompting a richer dialogue about the varied forms of the condition. 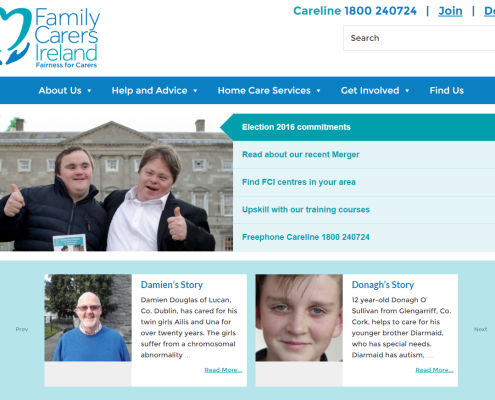 Family Carers Ireland has emerged from the coming together of two long standing charities of over 25 years – The Carers Association and Caring for Carers. The merger brings the best of both charities together whilst broadening the range of services and supports to family carers and giving one national voice to represent fairness for carers. Carers are at the heart of everything we do. 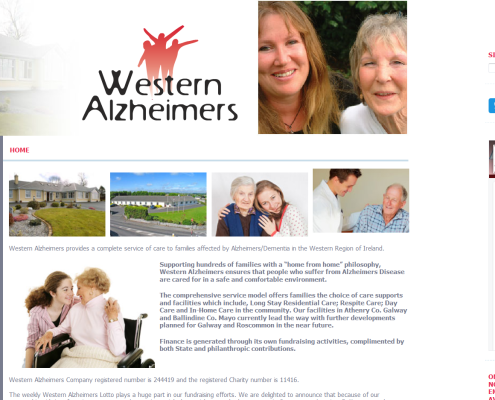 Supporting hundreds of families with a “home from home” philosophy, Western Alzheimer’s ensures that people who live with Alzheimer’s Disease are cared for in a safe and comfortable environment. 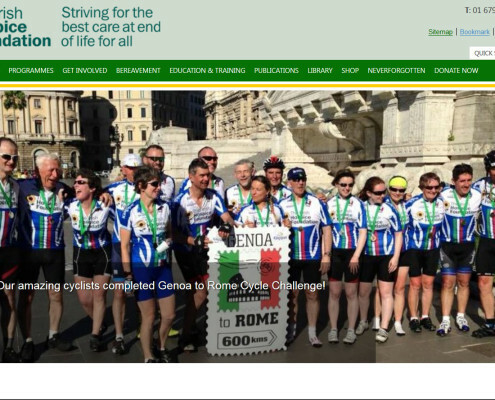 Description – The Irish Hospice Foundation (IHF) is a national charity dedicated to all matters relating to dying, death and bereavement in Ireland. 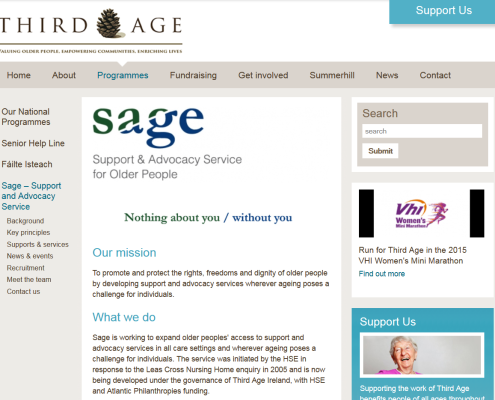 • Our VISION is that no one should face death or bereavement without the care and support they need. 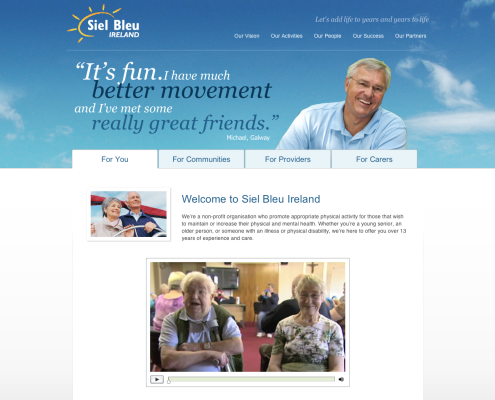 • Our MISSION is to achieve dignity, comfort and choice for all people facing the end of life. 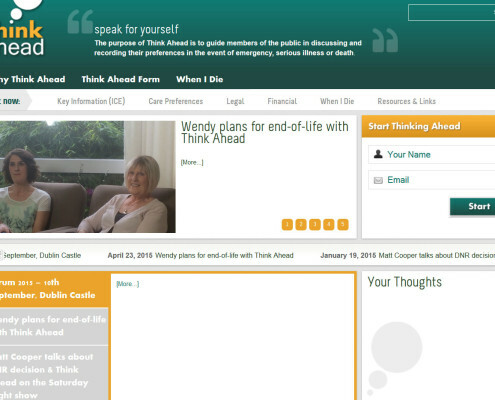 Think Ahead is a public awareness initiative aimed at guiding people in discussing and recording their care preferences in the event of an accident or other emergency, serious illness or death – when they may well be unable to speak for themselves. It comprises a detailed form divided into six sections: (1) Key Information; (2) Care Preferences; (3) Legal Matters; (4) Financial Matters; (5) When I Die; and (6) Sharing Information. 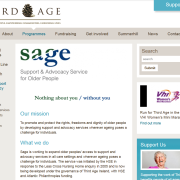 Sage is working to expand older peoples’ access to support and advocacy services in all care settings and wherever ageing poses a challenge for individuals. 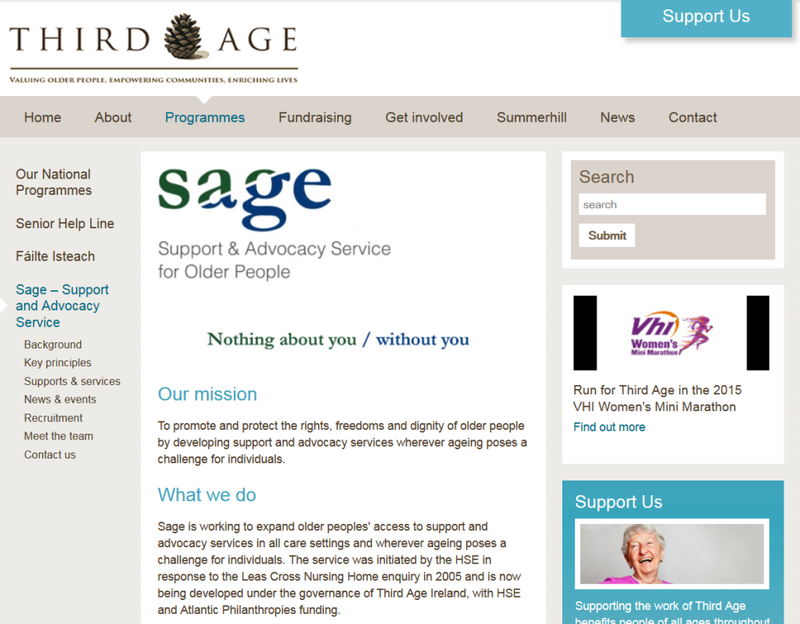 The service was initiated by the HSE in response to the Leas Cross Nursing Home enquiry in 2005 and is now being developed under the governance of Third Age Ireland, with HSE and Atlantic Philanthropies funding. 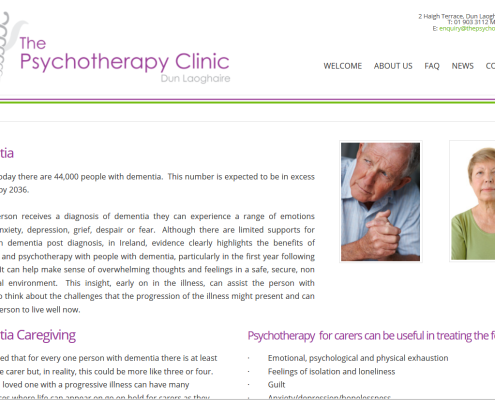 The Psychotherapy Clinic offers counselling and psychotherapy to adults of all ages in the Dublin area. We are professionally trained counsellors and psychotherapists with experience in working with dementia care givers and adults in the early stages of a dementia. At The Psychotherapy Clinic we are passionate about emotional well being and we understand dementia and the challenges of caring for a loved one with dementia. 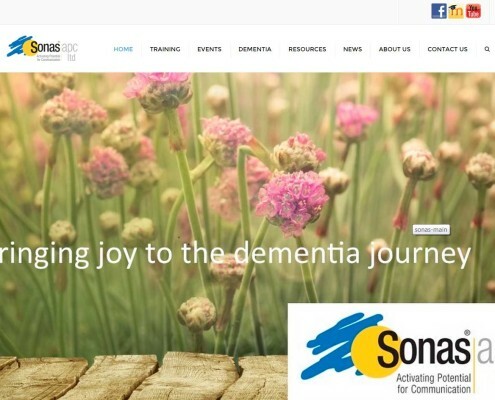 Sonas apc is a registered charity which tackles dementia head-on, delivering Ireland’s biggest annual international dementia conference and educating staff in more than 500 nursing homes and hospitals nationwide. 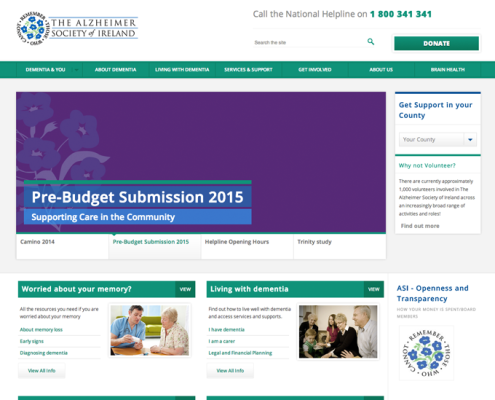 The Alzheimer Society of Ireland is the leading dementia specific service provider in Ireland. 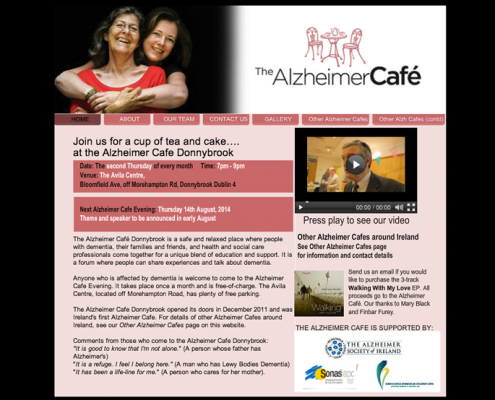 The Alzheimer Café Donnybrook is a safe and relaxed place where people with dementia, their families and friends, and health and social care professionals come together for a unique blend of education and support. 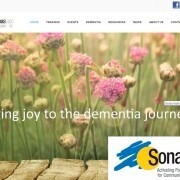 It is a forum where people can share experiences and talk about dementia.